Academy Award-winning filmmaker Martin Scorsese and the world's greatest rock n' roll band, The Rolling Stones, unite to bring audiences the year's most extraordinary film event, Shine a Light. With special appearances by Christina Aguilera, Jack White and Buddy Guy, and four Rolling Stones performances not seen in theaters, Shine a Light is a must-own for rock n' roll fans across generations. $1.488 million on 276 screens. At the end of every Rolling Stones tour since 1981-82, we get an inevitable concert film. Some made it to the big screen – like 1983’s Let’s Spend the Night Together and 1991’s At the Max - while others went solely for the video route. 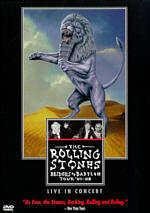 For something different, the Stones’ 2005-07 tour spawned two concert film productions. The expansive Biggest Bang set premiered at Best Buy back in 2006, but even though that package included four DVDs of material, the band wasn’t done. The Stones took the Last Waltz path with 2008’s theatrical release, Shine a Light. 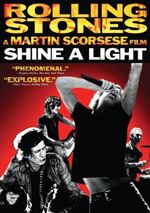 Directed by Waltz’s Martin Scorsese, Light concentrates on the band’s performances at New York’s Beacon Theater in the fall of 2006. They played October 29 and November 1. The second show – originally intended for Halloween but delayed a day due to problems with Mick’s voice – provides the majority of the material in Light. The early parts of Light give us a little info about preparations for the concert and the film. We see Scorsese and members of the Stones as they deal with their sides of things. We also check out pre-show elements like a meet and greet with President Clinton and others. 12 minutes into the piece, it becomes a pretty straight concert film. Some archival shots of the Stones appear, but most of Light sticks with modern concert footage of songs that span the band’s career. For the oldest songs, we find “(I Can’t Get No) Satisfaction” from 1965’s Out of Our Heads (US version) and “As Tears Go By” off of December’s Children (And Everybody’s). 1967’s Between the Buttons gives us “Connection”, and we find “Sympathy for the Devil” off of 1968’s Beggar’s Banquet. That year’s single “Jumping Jack Flash” also pops up, while “You Got the Silver” and “Live With Me” come from 1969’s Let It Bleed. From there we jump to 1981’s Tattoo You for mega-hit “Start Me Up”. “She Was Hot” from 1983’s Undercover brings us to the movie’s newest song. Finally, a cover of Muddy Waters’ “Champagne and Reefer” finishes the set. Except for “Connection” – marred by intrusive interview clips in its middle – all of these appear as standard performance segments. Note that a few guest stars appear here. Jack White duets on “Loving Cup”, and Christina Aguilera pops up for “Live With Me”. (For reasons unknown, this has become the default Female Guest Star Tune in recent years.) Buddy Guy guests for “Champagne and Reefer”, and he turns in by far the most electrifying spot of the three. I actually attended the November 1 show, but I can’t tell you how accurately Light represents the performance due to the quality of my seats. Despite the fact the Beacon only seats a few thousand, tickets cost a mere $50 and $25. I managed to land one of the latter, and that put me in the balcony. I didn’t think that’d be a problem given the venue’s diminutive size; after all, even a “bad seat” at the Beacon should still be good, right? Wrong. Apparently due to the design of the band’s stage, those of us in the back couldn’t see the whole show. From my vantage point, I rarely glimpsed Jagger, and Keith and Ronnie also tended to vanish much of the time. Good thing I like Charlie, since he was the only Stone I could observe the whole night! I still enjoyed the show, though more as an event than as a concert; I’ve been to many better performances by the Stones, so this one was fun but not quite as stellar as I’d hoped. I must admit it looks and sounds better on film than it did in person. 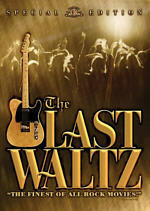 Given Scorsese’s fame and the lasting legend of The Last Waltz, fans expected a lot from Light. I don’t think Scorsese delivers anything as memorable as Waltz here, but he does create a well above-average concert flick. I’ve seen many a concert movie/video in my day, and many of them make the shows look downright boring. That never occurs during Light. If guilty of any sin, I’d say that Scorsese focuses too much on Mick. That concentration makes some sense since he’s the frontman and the most dynamic onstage presence of the bunch, but it still gets a little old. You begin to wonder if Scorsese only had one camera and couldn’t get around to the others. Nonetheless, the show provides a good visual depiction of the concert and avoids the usual quick-cutting and other gimmicks that mar so many performance films. The Stones certainly sound good – maybe a little too good. By that I mean I suspect a little – or a lot – of post-concert dubbing took place to fix up mistakes. I’ve seen the Stones live 45 times, and I don’t think I’ve ever witnessed them put on a show as tight as the one displayed in Light. Were they this tight on November 1, 2006? I can’t remember the performance well enough to say “absolutely not”, but 45 concerts that reach varying levels of sloppiness tell me that there’s some Memorex at work here. The Stones – especially Ronnie and Keith – just screw up too much for me to believe that this thing’s all from the actual show. No matter – I can’t blame the Stones and the filmmakers for a desire to give us a high-quality product, and post-concert “fixing” isn’t exactly news. If the Stones ever put out a “warts and all” concert album, I’d fall over from the shock. After all, this is the same band whose Got LIVE If You Want It actually took some studio tracks and added fake crowd noise to them! Any fixing involved here pales in comparison to more egregious examples. And it all comes in the service of a very good concert film. Will anyone ever view Shine a Light as a definitive performance movie or a glimpse of the Stones at the top of their game? No, but since the original concert wouldn’t even qualify among my personal top 10 Stones performances, that shouldn’t come as a surprise. It’s a very good flick and show, though, and one I’m happy to have. 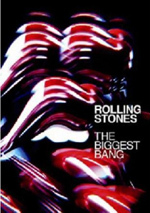 The Rolling Stones: Shine a Light appears in an aspect ratio of approximately 1.85:1 on this single-sided, double-layered DVD; the image has been enhanced for 16X9 televisions. Virtually no concerns emerged in this attractive presentation. Sharpness seemed solid. No problems with softness materialized here, as the film remained crisp and well-defined at all times. I noticed no issues with jagged edges or moiré effects, and I also detected no signs of edge enhancement. Source flaws looked absent. Most of the color variation came from lighting. The hues looked well developed and accurate. Even the thickest lighting remained distinctive and rich. Blacks were deep and dense, while low-light shots came across as clear and appropriately visible. This was a consistently positive presentation. Note that the pre-show snippets that fill much of the movie’s first 12 minutes looked considerably rougher than the rest of it. Most of these were black and white and very grainy. The filmmakers obviously wanted a particular effect here, so I didn’t hold these messy visuals against the rest of the flick. While not as successful, the Dolby Digital 5.1 soundtrack of Shine a Light satisfied. As one expects from a concert presentation, the soundfield remained focused on the front, where they showed strong stereo imaging. Mick’s vocals appeared firmly set in the middle. The instruments were accurately located and they demonstrated nice breadth and delineation. I could distinguish the various instruments with ease, as they were placed in a natural and clear manner. They also blended together smoothly to create a forward soundstage that consistently created a real and involving setting. Audio quality was generally solid. Mick’s vocals worked fine, as they replicated the desired impressions well. The rest of the track also showed good clarity and a dynamic tone. The instruments remained crisp and vivid during the concert. At times I thought bass response could’ve been a little deeper, as the track was marginally thin during some tracks. This wasn’t a true issue – more of a preference – so it didn’t detract terribly from the presentation. Taken as a whole, the audio worked fine. As for extras, we begin with a behind the scenes featurette. This 15-minute and 10-second piece mixes archival clips of the Stones, a few off the footage. The latter elements prove most interesting, especially when Jagger does some of the vocals for “Connection”; that’s the way the song worked in its 1967 album version, but on stage, it becomes a Richards solo track. In general, the featurette plays like a miniature version of the film, albeit one without any complete renditions of songs. Still, we find some nice glimpses of the rehearsals and a few interesting comments. I especially like Buddy Guy’s tale of why some refer to him with a profane name. This is a good featurette flawed only due to its brevity; I could watch hours more of this stuff. Four Bonus Songs come next. We find “Undercover of the Night”, “Paint It Black”, “Little T&A” and “I’m Free”. Taken together, they fill a total of 16 minutes, 47 seconds. I don’t know why Scorsese omitted them from the final flick, but I wouldn’t think this occurred due to performance quality, as all four sound good. They’re a nice addition. A few ads open the DVD. We get promos for American Teen, Son of Rambow, Defiance, and The Duchess. These also appear in the Previews area along with clips for Stop-Loss, Bob Dylan: No Direction Home and Neil Young: Heart of Gold. Martin Scorsese turns his filmmaking eye toward the Rolling Stones – and does so well. Shine a Light never becomes a stellar work, but it provides a very good concert film that delivers its subject well. The DVD offers excellent picture and positive audio, and while it doesn’t pack many extras, the included components are very good. It’s a fine concert, and the DVD’s reasonable list price of less than $20 makes it a must-buy.